← Want to join the next Willow Garage? Or the French version of Xerox Parc? What a great way to visit the parents! Sometimes, we see interesting stories in the media — and not just on major news networks or websites. This article was found in a local newspaper in North Vernon, Indiana and shows yet another place for remote presence to make a difference. The original engineer behind the precursor to the Beam, Dallas Goecker, demonstrated the RPD at his parents hardware store in central Indiana. The photo and the article is quite nice — covering all of the points that explain the Beam quite well. How can you be in two places at the same time? Dallas Goecker does that, in a way, every work day. I went to meet Dallas at his parent’s store, Goecker Building Supplies, in North Vernon the other day. We talked face to face and eye to eye, joked with his mother and father, Don and Marsha and walked around the store together. I also took a few photographs of Dallas with his parents. Funny thing, though, Dallas wasn’t really in North Vernon. He was 15 miles away in Seymour. Through an ultramodern marvel that Goecker helped create, a Beam Remote Presence System, he was in essence in two places at once. 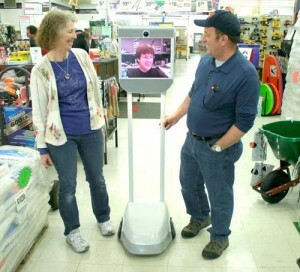 “Wow, that is amazing,” said one customer at the northside store who saw the robotic-like device while I was there. Other customers were also doing double and triple takes. “The people coming in this morning seem to like it,” chuckled Don Goecker, a justifiably proud papa. Read the rest of the article in the PlainDealer-Sun. This entry was posted in Beam, Remote Presence Systems, Suitable Technologies and tagged Beam, Dallas Goecker, remote presence, remote presence systems, Suitable Technologies. Bookmark the permalink.